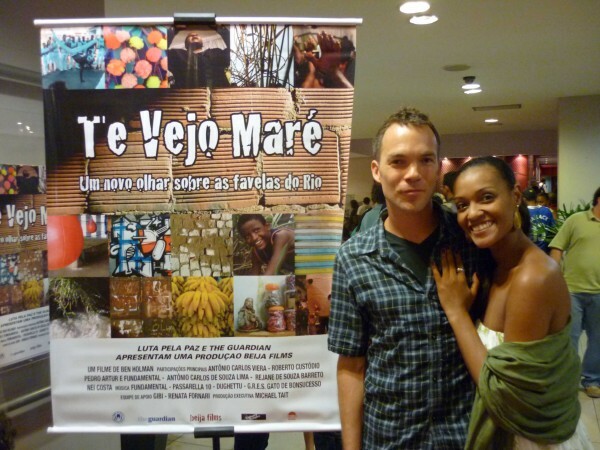 Last night saw a packed World Premiere of Te Vejo Maré, the full length version of Ben Holman’s documentary that is currently being serialised by the UK’s Guardian newspaper. The event took place at the Botafogo Unibanco Arteplex, one of Rio’s best cinemas, where fans sat in aisles and stairwells to see the film. 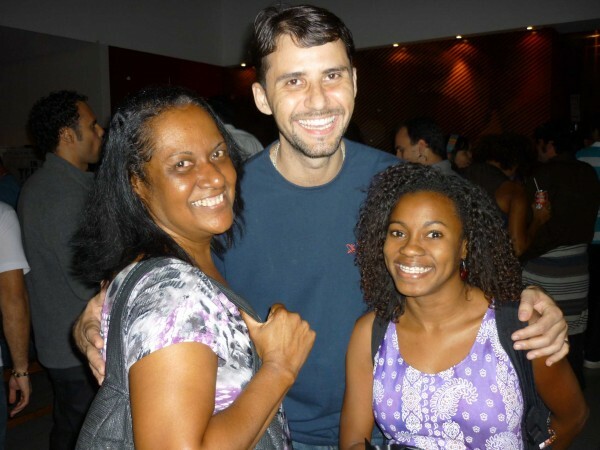 Photos: Top – Ben Holman, Associate Producer Renata Fornari and Retalhos Cariocas; Middle – Ben and Renata; Bottom: Sinval, Dona Mirian and Viviane, all from Fight for Peace in Maré. A Saturday night in May and Cineclube Ação da Cidadania brings open air cinema to Morro da Providência, Brazil’s first favela. 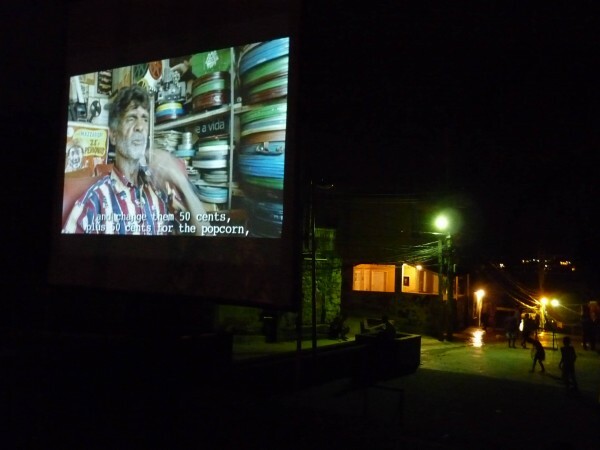 The night kicked off with a short film and continued with O Contador de Historias, the true story of a São Paulo street kid who became one of the world’s top story tellers. Watch this space for more Cineclube Ação da Cidadania events in Providência…The event was put on in conjunction with Favelarte and Casa Amarela Cultural Cooperative. 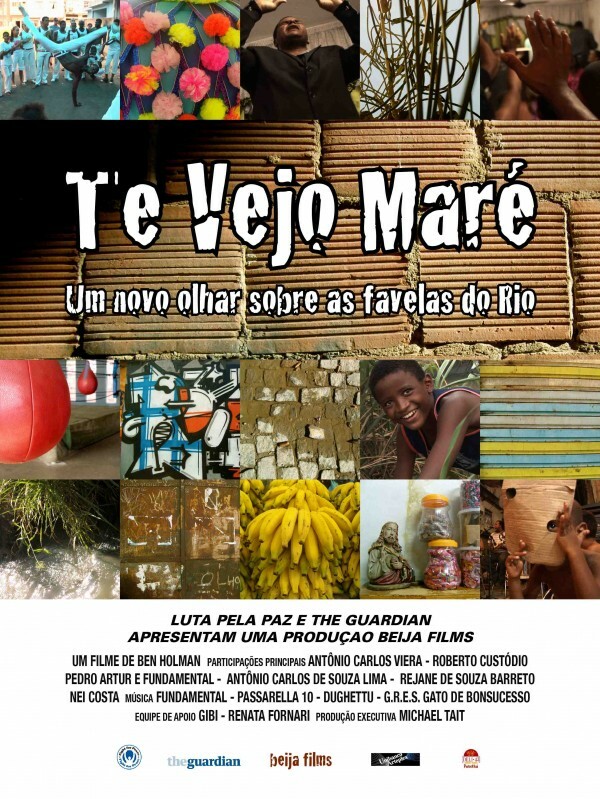 Here is the full trailer from Te Vejo Maré, the Beija films production that will be showing its premiere at the Cine Arteplex in Botafogo, Rio de Janeiro, this Monday at 9pm, and that will be serialised on the website of the UK’s Guardian newspaper beginning on the 17th of May, same day as the premiere. Our friends at Beija films have produced a groundbreaking feature documentary that portrays the day to day in Maré, one of Rio’s largest favela communities. Visitors to the city usually pass by this neighbourhood in taxis on their way from the airport to the glamorous Zona Sul. Here is a chance to look inside and learn about the lives of inhabitants of this very unique part of Rio. This documentary is being serialised for the Guardian newspaper.